21 Super Bowls - Whose Shake Is This!!? There’s been a changing of guard at the top of Formula 1 that has been years in the making and should have happened years ago. But Bernie Ecclestone clung on for 40 years, until now. He is finally out the door at last and his perpetually constipated hard bowel movement scowl is being replaced by Chase Carey and his dapper moustache. Non F1 fans will have to take me at my word that this is a good thing for motorsports. Bernie was like a one-man France Family, only worse, but without the NASCAR scion’s inherent charm.1 Like Sepp Blatter at FIFA, he pretty much overstayed his welcome. And so on…. F1 fans don’t need any of this spelled out. Chase Carey wants to liven F1 up, expand its appeal, and make each race more of a week-long extravaganza. He wants to make each race a Super Bowl. F1 would have 21 Super Bowls. It’s a nice idea I suppose, certainly more fun than anything Bernie could have come up with, but….BUT……what are we talking about here besides race weekend? Concerts? Art festivals? Craft fairs? Shakespeare in the Park? Swap meets? Mimes? Puppets? Parades? Vendors selling BBQ Ribs and LSD Simulators? Mud wrestling? Pub Football? Bingo? 21 Super Bowls. My word. In the USA! USA!! USA!!! one Super Bowl is MORE than enough. But he wants the US Gran Prix to be one! To all of the above I supposed we’ll add heretic burnings and snake roasts and call it a day. On the podium, Lewis Hamilton will not only wear a cowboy hat and eat a roasted snake, he will also burn a heretic. No scratch that….Nico Rosberg has retired. So Lewis will instead fire guns into the air. More F1 predictions to follow later in the month when I sort out the changes to the car and the teams for 2017. That plus the rules. For Sutton United, a small, neighborhood club in the SW London suburbs, winning this FA cup tie against Leeds United was pretty much like winning the Super Bowl. 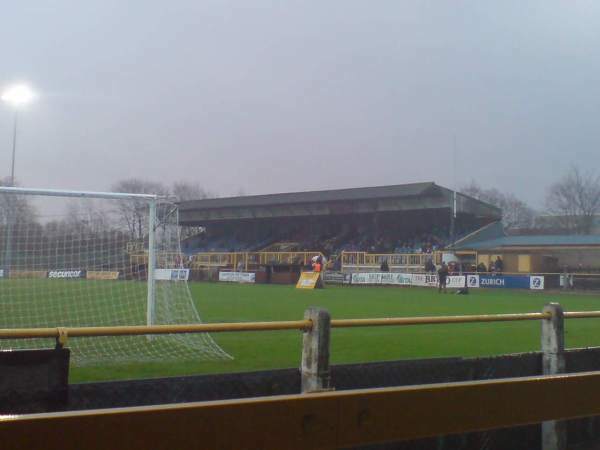 A crowd of 4,997 were packed into Gander Green Lane, Sutton United’s stadium, to watch the underdogs take down Leeds on Jamie Collins’ penalty kick at the 53rd minute. Sutton United is currently 16th in England’s National League table. The National League is the 5th level in English football. The Premier League is 1st, and the Championship where Leeds holds down 4th place is the 2nd level. So this was a remarkable once in a lifetime upset. But another possible upset awaits them. In the Sweet 16 of the FA Cup, the 5th Round Proper, Sutton United was drawn against Arsenal, currently 3rd in the Premier League. The tie will be Monday Feb 20th at Gander Green Lane and the whole world will be watching this and FS1 will be televising this. The Gooners will be sweating this one out. It doesn’t in a way matter if Arsenal wins this and jogs on. Simply being in the 5th Round is already a big win for Sutton United. They bring a lot of badly need money back to the club….and yes, the club down the pyramid always need and appreciate the money as much as they appreciate being there to compete. But in Sutton’s case, it’s the competition that makes them and their fans the happiest. Roger Goodell levels the playing field…. Chase Carey wants to turn F1 into 21 Super Bowls. The NFL already has one, every year. Super Bowl 51 will be this Sunday in Houston—New England vs. Atlanta. 51 Super Bowls!! So the NFL has F1 beat there. But in less than 3 years F1 will catch up and surpass. That’s what Carey is counting on…hoping for. Of course, the NFL reached 21 Super Bowls 30 years ago. In Super Bowl 21, the favoured New York Ginats beat the Denver Broncos 39-20 at the Rose Bowl in Pasadena. That tilt featured 2 reasonably obscure quarterbacks…Phil Simms and John Elway. Carey’s counterpart at the NFL, Roger Goodell, just wants the damn thing to be done and over with….especially the part about handing out the Lombardi Trophy….which will more likely go to his now enemies, once friends, Tom Brady, Bill Belichek, and Bob Kraft. Obviously, he’d rather hand it out to Matt Ryan and the Atlanta Falcons. So in his pre-Super Bowl presser while he dodged the questions about that, he hatched a secret plot. To level the playing field, Roger Goodell is going to make Tom Brady play wearing a skirt. That should do the trick just nicely. My prediction sure to go wrong is: Atlanta 37 New England 33. But if you want to bet all your mother-in-law’s money on that sort of outcome, go right ahead. That’s your lookout. As for me, I don’t plan on writing anything more about American Football for a good long while. See?? I can be just a cynical as all the rest with my bland and deadly courtesies…. This little bit on the Chelsea/ArseAnal tilt is not MY thoughts on it per se. It’s just my insight on what constitutes proper football for most fans on the game….small local teams in small stadiums where you can bring your dog if you have a fancy to do so.